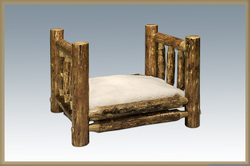 Treat your pet to the ultimate comfort experience while bringing the beauty of rustic log furniture into your home. 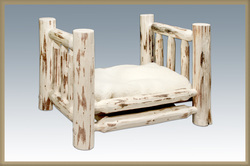 Frame is built from solid lodgepole pine.Featuring a plush mattress specifically made for pets, this pet bed is sure to be your pet's favorite place of rest. 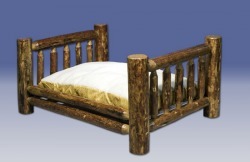 A 30" x 40" fleece lined mattress is included..
We now have a smaller version of our famous log pet bed for your smaller pets! Overall measurements are 26" long x 21" deep and 17" high. 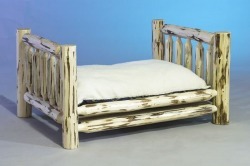 Comes complete with a 16" x 20" fleece lined mattress pad. It has two; 3-quart stainless steel bowls (with little paw prints embossed on the edges), which can be used for multiple pets, or alternatively, fill one bowl with water and the other bowl with food, something your pets are sure to appreciate. Never clean up another mess! 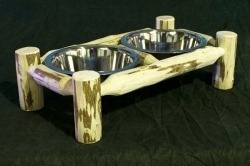 This pet feeder is of durable design and construction and not likely to be overturned or pushed around the house by your pet. 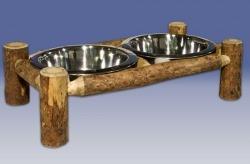 At 7 inches high, this beautiful feeder can be used with a variety of animals. Outside measurements of the Pet Feeder are 23"W x 13"D x 7"H.